Since the classic study of Worden et al. (2000), we have known directing attention to the location of an upcoming target leads to a suppression of alpha-band EEG activity over the contralateral hemisphere. This is usually thought to reflect a preparatory process that increases cortical excitability in the hemisphere that will eventually process the upcoming target (or decreases excitability in the opposite hemisphere). This can be contrasted with the N2pc component, which reflects the focusing of attention onto a currently visible target (reviewed by Luck, 2012). But do these different neural signals actually reflect similar underlying attentional mechanisms? The answer in a new study by Felix Bacigalupo (now on the faculty at Pontificia Universidad Catolica de Chile) appears to be both “yes” (the N2pc component and lateralized alpha suppression can both be triggered by a target, and they are both influenced by some of the same experimental manipulations) and “no” (they have different time courses and are influenced differently by other manipulations). The study involved two experiments that we were designed to determine whether (a) lateralized alpha suppression would be triggered by a target in a visual search array, and (b) whether this effect could be experimentally dissociated from the N2pc component. The first experiment (shown in the figure below) used a fairly typical N2pc design. Subjects searched for an item of a specific color for a given block of trials. The target color appeared (unpredictably) at one of four locations. Previous research has shown that the N2pc component is primarily present for targets in the lower visual field, and we replicated this result (see ERP waveforms below). We also found that, although alpha-band activity was suppressed over both hemispheres following target presentation, this suppression was greater over the hemisphere contralateral to the target. Remarkably, like the N2pc component, the target-elicited lateralized alpha suppression (TELAS) occurred primarily for targets in the lower visual field. However, the time course of the TELAS was quite different from that of the N2pc. The scalp distribution of the TELAS also appeared to be more posterior than that of the N2pc component (although this was not formally compared). The second experiment included a crowding manipulation, following up on a previous study in which the N2pc component was found to be largest when flanked by distractors that are at the edge of the crowding range, with a smaller N2pc when the distractors are so close that they prevent perception of the target shape (Bacigalupo & Luck, 2015). We replicated the previous result, but we saw a different pattern with the lateralized alpha suppression: The TELAS effect tended to increase progressively as the flanker distance decreased, with the largest magnitude for the most crowded displays. Thus, the TELAS effect appears to be related to difficulty or effort, whereas the N2pc component appears to be related to whether or not the target is successfully selected. The bottom line is that visual search targets trigger both an N2pc component and a contralateral suppression of alpha-band EEG oscillations, especially when the targets are in the lower visual field, but the N2pc component and the TELAS effect can also be dissociated, reflecting different mechanisms of attention. These results are also relevant for the question of whether lateralized alpha effects reflect an increase in alpha in the nontarget hemisphere to suppress information that would otherwise be processed by that hemisphere or, instead, a decrease in alpha in the target hemisphere to enhance the processing of target information. If the TELAS effect reflected processes related to distractors in the hemifield opposite to the target, then we would not expect it to be related to whether the target was in the upper or lower field or whether flankers were near the target item. Thus, the present results are consistent with a role of alpha suppression in increasing the processing of information from the target itself (see also a recent review paper by Josh Foster and Ed Awh). One interesting side finding: The contralateral positivity that often follows the N2pc component (similar to a Pd component) was clearly present for the upper-field targets. It was difficult to know the amplitude of this component for the lower-field targets given the overlapping N2pc and SPCN components, but the upper-field targets clearly elicited a strong contralateral positivity with little or no N2pc. This provides an interesting dissociation between the post-N2pc contralateral positivity and the N2pc component. Gaspelin, N., & Luck, S. J. (in press). Combined Electrophysiological and Behavioral Evidence for the Suppression of Salient Distractors. Journal of Cognitive Neuroscience. Evidence that people can suppress salient-but-irrelevant color singletons has come from ERP studies and from behavioral studies. 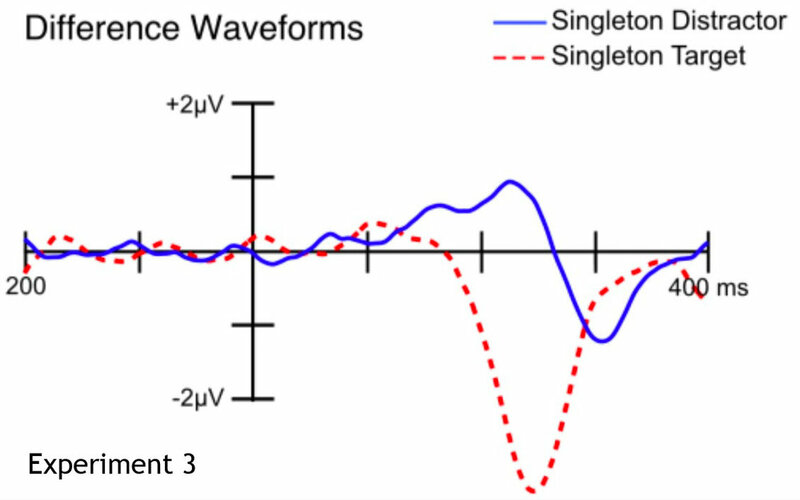 The ERP studies find that, under appropriate conditions, singleton distractors will elicit a Pd component, a putative electrophysiological signature of suppression (discovered by Hickey, Di Lollo, and McDonald, 2009). The behavioral studies show that processing at the location of the singleton is suppressed below the level of nonsingleton distractors (reviewed by Gaspelin & Luck, 2018). Are these electrophysiological and behavioral signatures of suppression actually related? In the present study, Nick Gaspelin and I used an experimental paradigm in which it was possible to assess both the ERP and behavioral measures of suppression. First, we were able to demonstrate that suppression of the salient singleton distractors was present according to both measures. Second, we found that these two measures were correlated: participants who should a larger Pd also showed greater behavioral suppression. Correlations like these can be difficult to find (and believe). First, both the ERP and behavioral measures can be noisy, which attenuates the strength of the correlation and reduces power. Second, spurious correlations are easy to find when there are a lot of possible variables to correlate and relatively small Ns. A typical ERP session is about 3 hours, so it's difficult to have the kinds of Ns that one might like in a correlational study. To address these problems, we conducted two experiments. The first was not well powered to detect a correlation (in part because we had no idea how large the correlation would be, making it difficult to assess the power). We did find a correlation, but we were skeptical because of the small N. We then used the results of the first experiment to design a second experiment that was optimized and powered to detect the correlation, using an a priori analysis approach developed from the first experiment. This gave us much more confidence that the correlation was real. We also included a third experiment that was suggested by the alway-thoughtful John McDonald. As you can see from the image above, the Pd component was quite early in Experiments 1 and 2. Some authors have argued that an early contralateral positivity of this nature is not actually the suppression-related Pd component but instead reflects an automatic salience detection process. To address this possibility, we simply made the salient singleton the target. If the early positivity reflects an automatic salience detection process, then it should be present whether the singleton is a distractor or a target. However, if it reflects a task-dependent suppression mechanism, then it should be eliminated when subjects are trying to focus attention onto the singleton. We found that most of this early positivity was eliminated when the singleton was the target. The very earliest part (before 150 ms) was still present when the singleton was the target, but most of the effect was present only when the singleton was a to-be-ignored distractor. In other words, the positivity was not driven by salience per se, but occurred primarily when the task required suppressing the singleton. This demonstrates very clearly that the suppression-related Pd component can appear as early as 150 ms when elicited by a highly salient (but irrelevant) singleton.